I normally create a star chart and list of highlights for each observing session during the summer at UofM when I’m not going to be there. This year, I thought I would get them done ahead of time and do the ones I will be at too. Having spent a couple hours putting this together, I thought it might be worth sharing. Especially since I spent some time sorting through things I know we can find and things that might be a challenge for our urban observatory. Hopefully other urban observers will also find this useful. Charts were created using Starry Night College and are formatted for printing. The pages are black with red text so they won’t ruin your night vision if you look at them on a screen. Summer star charts and Observing Highlights. One note for anyone in the area looking at this, please note that most of these are not public events. Public Open houses at Angell Hall are posted at http://www.astro.lsa.umich.edu/sas/openhouse.html and Viewing Nights at the Detroit Observatory are at http://www.astro.lsa.umich.edu/outreach/detroit.php. Posted by aquillam in Detroit Observatory. The video was taken with a cell phone, so so it is small, and the sound quality is terrible. ** Jargon warning! This blog post necessarily uses a great deal of jargon. If I define all of it here, it will be ridiculously long, so I recommend looking up to following words on the telescope dictionary page: meridian, Right Ascension (RA), declination and sidereal time. 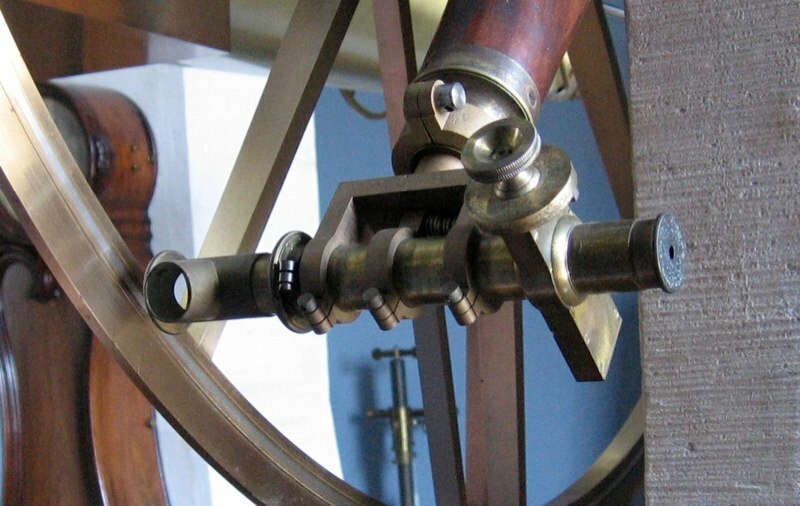 The Pistor & Martins Meridian Circle telescope at the Detroit Observatory in Ann Arbor was built to be a very precise instrument. A Meridian Circle can be used either to measure the Right Ascension (RA) if you know the sidereal time, or the sidereal time if you know the RA. The Detroit Observatory was primarily used to determine the time, and a signal was regularly sent the the Michigan Central Railroad from there. Diagram of the harp. The dashed line is the traveler. The faint dotted line is the location of a thread that is missing. To determine the time accurately, the eyepiece of the telescope had a harp – a set of lines made from spider silk. The observer would set the telescope to the declination of a star that was soon going to transit, then wait for the star to come into view. If the declination is accurate, the star should appear between the two horizontal lines. 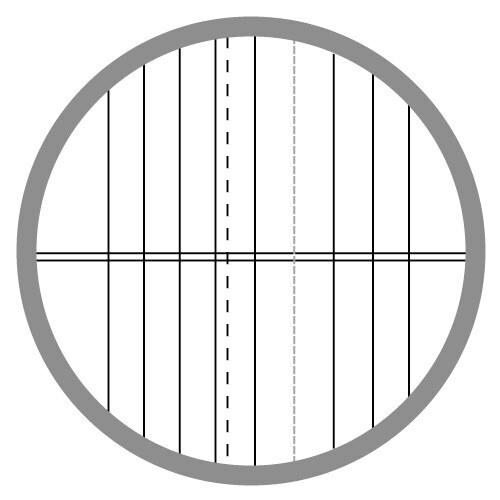 The observer can then align the “traveler”, a line that can be moved by means of the micrometer on the eyepiece. The micrometer dials on the eyepiece move the traveler, so the observer could track the star through the field. The micrometer. The ivory dial and brass knob sticking out of it are the coarse and fine controls for adjusting the traveler. When the observer believed the star was exactly in the center, there was a button to push, which would place a mark on the roll of paper in the chronograph (a device to graphically record time.) 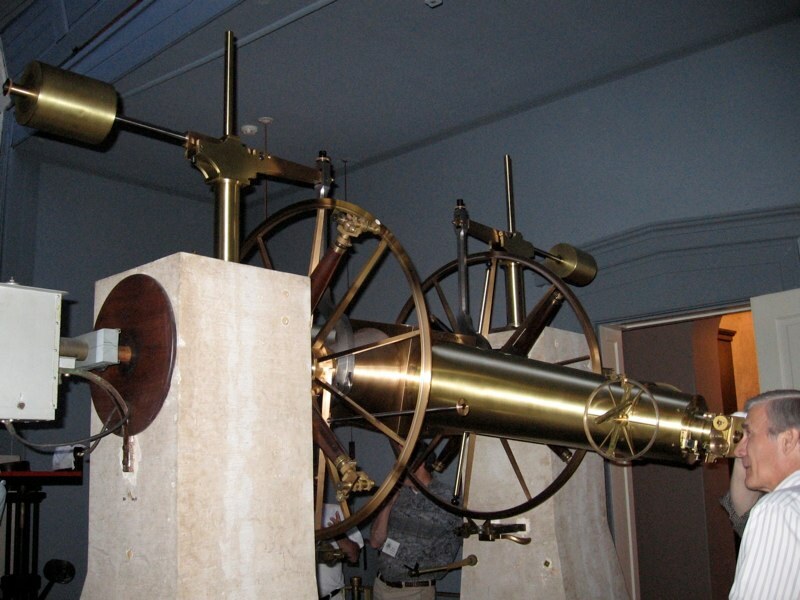 A sidereal clock in the observatory was also tied to the chronograph, and the star’s position and rate of travel was used to confirm the accuracy of the sidereal clock. The chronograph could then be used to accurately set the clocks in the observatory, and the time would be sent to the railroad via telegraph. 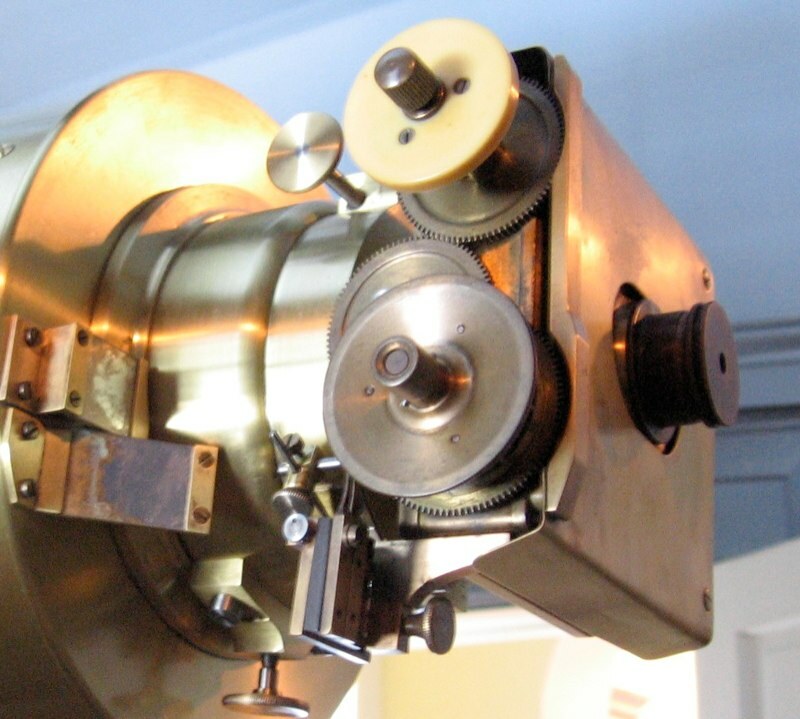 Once the clocks were set, the observer could align the telescope on a new star. The same procedure would be repeated (center the star in the horizontal lines, align the traveler, push the button when the star is at the center). This time however, the time would be read from the chronograph, and the observer would record that sidereal time as the RA of the star. A microscope was required to read the numbers engraved on the circle. The opening in the side allows an assistant to hold a lantern to light the numbers. Finally, the precise declination of the star was read from the setting circles which give the meridian circle its name. The circles were marked to so fine an increment that microscopes were required to read the position. Since it was assumed that the circles were not perfect, the observer would take a total of 4 readings, one from each quadrant of the circle. Note: this page is occasionally updated as I gain a better understanding of how the instrument works.